Sulfites Added to Wine: The Reason You Get a Hangover? Even in the world of organic wines, there is a spectrum. You can have many spirited conversations (pun intended) about how "pure" pure can be, and now natural a wine might be. How do you determine if the sulfites in wine are causing headaches? 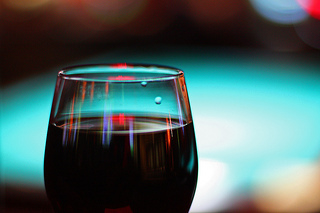 Raise your hand if you've ever heard this before: "Drinking red wine gives me a headache. I'm allergic to sulfites." In red wine, "sulfites get a bad rap," says Annie Rabin Arnold, owner of the Organic Wine Exchange. "People often blame sulphur, when in reality there are a host of other issues that may contribute to headaches." As W. Blake Gray writes in The Gray Report, some people really are allergic to sulfites, and it can be a life-threatening condition. Should you fear the sulfites in your wine? Should you seek out wine that doesn't have any sulphur added? It's easy to obsess about sulfites because wine with sulfites must be labeled as such if it is to be sold in the US. It's been that way since 1987, when the phrase "contains sulfites" was legally mandated to appear on wine labels. Even my righteous bought-in-Whole-Foods Agriculture Biologique Bordeaux has sulfites in it - it says so right on the label. In fact, commercial wineries add lots of chemicals to their products, and some people might have an allergic reaction to those chemicals, and blame it on the sulfites. Drink the wine. Lose the sulfites? All wine contains some sulfites. Most of them are dissolved in the aging process. But there are options for those who want to drink wine with no additional sulfites, beyond what might occur naturally. There are winemakers, like Paul Frey of Frey Vineyards in Redwood Valley, CA, who don't add these chemicals to any of their wines. As Frey told me in an interview, for most of wine's eight-thousand year history it was made without any synthetic additives at all. "Sulphur dioxide is a relatively new industrial ingredient in the history of wine," he said. "Sulfite is a nonessential preservative," Frey said. It has never been allowed as an additive in any food or wine that carries the USDA organic seal. "By using alternative organic methods, food processors and winemakers do not need to use sulfur dioxide," Frey added. Other winemakers would take issue with that, saying that adding small amounts of sulphur dioxide stabilizes the wine, enhancing flavors, or even can be used to save a questionable batch. Winemaker Robert Sinskey adds sulphur to his wines, and has written: "Even if a farm is organic or Biodynamic, it is, at best, a simulation of nature. Every choice a farmer makes is an intervention, just as every choice a winemaker makes is an intervention." We are not perfect. Dig deep enough and you will find inconsistencies and contradictions, as you will find with every 'natural' producer. Once a human is involved in the farming and winemaking process, we are no longer working in a natural environment, though we can emulate natural systems, every decision we make is an intervention. Even in the world of organic wines, there is a spectrum. You can have many spirited conversations (pun intended) about how "pure" pure can be, and now natural a wine might be. Paul Frey explained in our conversation that the first known law that allowed the use of sulfites was very restrictive. Even today, many natural wine purists consider sulphur a chemical of last resort, to be added only to save wine that might have become unstable. Paul Frey would even say "no" to all that. "The root of and heart of organic is preservative- and additive-free," he told me. I think it gets down to whether you see wine as an industrial or an agricultural product, a completely commercial enterprise needing a long supermarket or liquor store shelf life, or a personal passion of artistic expression that needs to turn a profit in order to support the winemaker. Many winemakers, like Robert Sinskey, will add sulphur if it can help a wine worth helping. Sinskey points out that he grows wine in a region dominated by a paradigm of science and technology, a place dominated by the assumption that additives, preservatives and modifications are necessary for wine to be good and for winemakers to prosper. So what's the bottom line? How do you determine if the sulfites in wine are causing headaches? According to WebMD, the FDA estimates that one out of 100 people are sensitive to sulphur compounds. If you've ever gotten a reaction after eating dried fruit, which often contains sulphur as a preservative, then you may be among those who are sensitive to sulphur in varying degrees, from intolerance to allergic reactions. But if dried fruit doesn't bother you, and you're still getting headaches, you might having a reaction to the chemicals that are added to the industrialized wine. The only way you'll know for sure is to try an organic wine, or a wine made with minimal intervention -- because then you'll know what's not in it -- no added sulphur or mystery chemicals. Photo Credit: USDAgov via Creative Commons License.